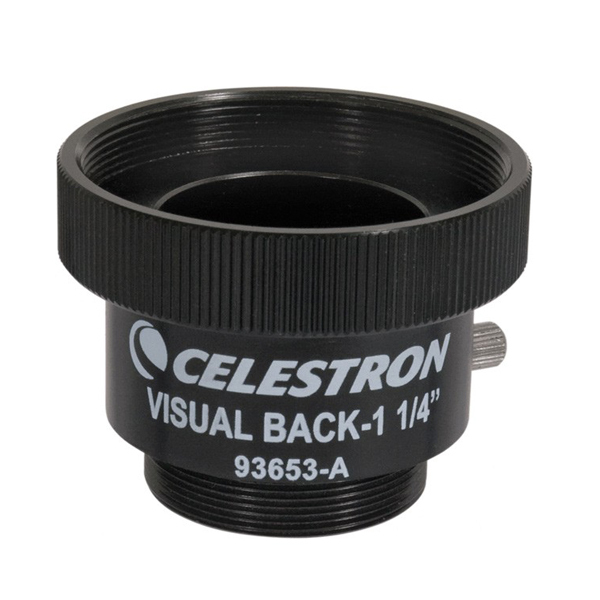 A Visual Back is a metal adapter that screws onto the standard rear cell threads of Schmidt-Cassegrain and some (but not all) Maksutov-Cassegrain telescopes and accepts 1.25” accessories, including diagonals, eyepieces (for straight-through viewing), Barlows, webcams, and any other accessory with a 1.25” insert barrel. All Celestron 5", 6", 8", 9.25" and 11" Schmidt-Cassegrains come standard with the 1.25” Visual Back. Total length = 43.3mm / 1.71". Weight = 2.6oz. Features two thumbscrews for a more secure hold. Includes one plastic end cap. Thread specification of female SCT thread on the telescope side is 2"x24TPI. 4.8 (Based on 6 Reviews) 100% of reviewers recommended this product. Works as described. Purchased for a C9.25 I gave to a family member. I had a 2" & AstroPhotography back which I wanted to keep. Couldn't find the original 1 1/4" back so ordered this one. Fits and works fine! The build quality is excellent. Great product and value for money. Enjoy shopping online for products on this site. Bought a used C8 and the visual back it came with was pretty beaten up. This one worked fine. It would be nice if Celestron would stop plastering their logo and name in huge print all over everything (telescopes included), but there you go.